BEFORE: Day two of the Clint Eastwood chain is yet another directing/acting credit on Eastwood’s resume. One of the reasons I chose this specific Eastwood film is it co-stars Jeff Daniels. Daniels stars on one of my favorite new TV shows, Aaron Sorkin’s The Newsroom. He’s doing a fantastic job and I can’t wait to see some of his earlier work. AFTER: Mysteries can elicit a variety of reactions from a variety of people. Someone could not like a mystery because they know the answer whereas someone who doesn’t know what’s going on remains intrigued and is struck by an ‘Ah-ha’ moment at the end. Like the characters in the film, I was clueless about what was going on until something was revealed. It was a great mystery with a lot of twists and suspenseful moments that kept me on the edge of my seat. There were even some scenes throughout the film where I had picked up on some of the clues that were key to solving the murders. Another testament to why I think this film is so good is the reveal at the end. I had many guesses on who the killer was, and one of my early predictions turned out to be correct. But I kept double-guessing myself as new evidence came up. “No, he/she couldn’t possibly be the killer. The clues don’t add up here,” I would tell myself. It was very similar to The Usual Suspects for me. I had correctly guessed who Keyser Söze was from the first scene but by the end of the film I was convinced there was no way I was right. Then the reveal came, and I was stunned. 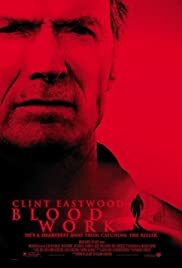 The reveal in Blood Work isn’t quite as shocking as The Usual Suspects, but the film was very entertaining and kept me guessing for most of the film.